I found a pile of lead in one of my less frequented boxes under the cellar stairs the other day. Several really nice, old school barbarian-types made by Grenadier back in the day. Here is the first I have painted up as a kind of test piece. I think I might have enough of these guys to make several units for Kings of War, especially if I put them on the 30mm bases. 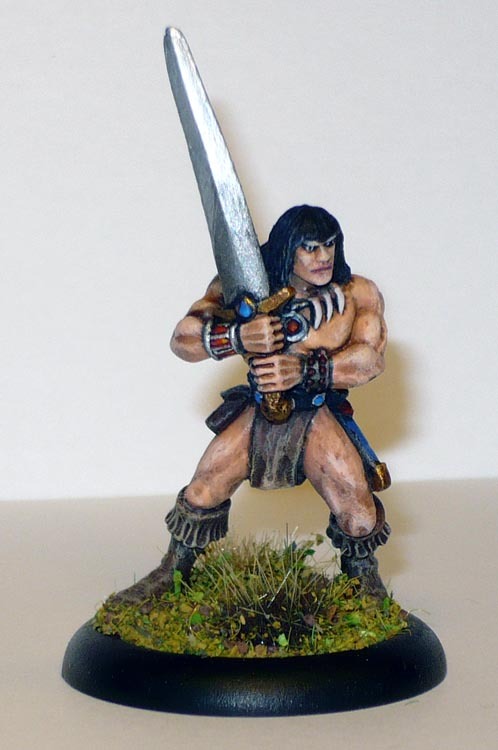 This guy is probably the most “Conan” miniature I know of. Even more than the plastic barbarian in the original HeroQuest game. The face, the hair, the…everything, really. I believe it was sculpted by Mark Copplestone. Also, that must be a broadsword. Or a cricket bat. At any rate, that is the first finished mini for July. I also have a bunch of skeletons and zombies on the “in progress” shelf. Nice work on Conan here. It’s a great figure and you’ve done a very nice job on him.